So yeah, this message may not be as well written as others, but the point needed to be conveyed is to enjoy each day as if it were your last, and to do what you love. For most of us who read this book, that is math, so try your hardest at your classes, and continue your studies with fervor. Also I must say I agree with Stephen D McIntyre in the previous page. Benjamin Parryman. N.C. State University. It’s been a good semester here. I definitely learned a lot of math, and a little Russian. For future students, try to meet Russian people and enjoy being in Russia. The phones are hard to figure out how to use. It really helps to learn at least a little Russian. Above all, learn some math and have a fun semester. I spent a year at IUM before going to graduate school. I learned a lot of math here, and feel better prepared for grad school because of it. I came here to learn math and Russian, which I did (although of course there’s much much more to learn) and also because I’ve always wanted to come to Russia. It’s certainly been interesting. 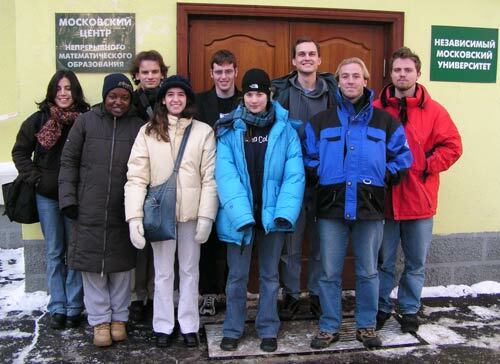 Math in Moscow is a great way to learn new math while experiencing a new culture! J’ai beaucoup apprécié mon séjour à Moscou. Le programme est exceptionnel, j’y ai beaucoup appris! My stay in Moscow challenged me thoroughly. I have definitely grown personally and mathematically. Dorian Smith. University of Arizona.